A German trade delegation is in Tehran to talk business with Iranian officials and size up investment opportunities in the country. 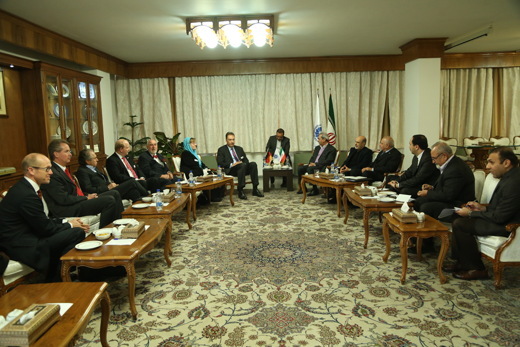 The German delegation, which is in Iran after 20 years, opened direct talks with Iranian businessmen in Iran’s Chamber of Commerce, Industries and Mines (ICCIM). Since last year when the Geneva talks got underway [over Iran’s nuclear program], different trade delegations have come to Iran to size up investment opportunities in the country. The trip by the German delegation comes after a visit by a French group. The German team is comprised of the representatives of 29 companies and 34 tradesmen together with the heads of the German Near and Middle East Association (NUMOV) which has played a key role in Germany’s trade ties over the past 80 years. According to Burkhard Dahmen, an NUMOV vice president, the business team intends to assess Iran’s investment opportunities in the areas of transportation, machinery, foodstuff and technology. Management of water resources is another issue the Germans are to exchange information with Iranian officials about. Dahmen also said that the Iranians have positive views of the Germans and we hope we can encourage politicians [on both sides] to explore the ways of enhancing relations. The German delegation will continue its meetings in Tehran until Tuesday December 9, and has on its agenda plans to meet with Minister of Agriculture Mahmoud Hojjati and Minister of Industry, Mines and Trade Mohammad-Reza Nematzadeh.